As countries across the world increasingly experience water scarcity, the ‘water-is-the-new-oil’ adage has come to the fore thousand times. So too has ‘data-is-the-new-oil’, this time to reflect the immense commercial value of data in a global digital economy. If we were to think of data as the new water instead, it may take us to ponder over the way data can help facilitate sustainable management of water resources, more efficient use of water, and ultimately, democratise access to safe drinking water and sanitation so that no one is left behind. In 1993 the United Nations designated 22nd of March as World Water Day as a means of focusing attention on the importance of freshwater and advocating for the sustainable management of freshwater resources. The theme in 2019, “Leaving No One Behind”, links directly to the human rights to water and sanitation (A/RES/64/292 and A/RES/70/169 Resolutions) and politically to the Sustainable Development Goal 6, which seeks to “ensure availability and sustainable management of water and sanitation for all”. It is a day to pause and reflect on our attitudes towards water, to stop taking water for granted. It is a day to think about why many women, youth, children, refugees, indigenous people, disabled people, and many others are being left behind and what it is like for billions of people around the world who cannot simply get access to safely managed water and sanitation. While current water trends paint a rather sobering picture for the future, there are many reasons to be optimistic. There is increasing awareness of the challenges and eagerness to find new approaches to ensure that no one is left behind and break the barriers to ensure this vital resource is managed wisely and responsibly to meet the sustainable development goal on water and sanitation (SDG6). However, to achieve this we need reliable, timely and granular data to monitor the positive or negative trends, and to change the way we make decisions today. Today, water in many countries fall far short of the fundamental goal of being complete, accessible and usable so that they are readily available and useful for making decisions.  Almost 60% of countries do not have data available for more than four global SDG6 indicators, and only 6% reported on more than eight global indicators, representing a major knowledge gap. According to WHO and UNICEF’s Joint Monitoring Programme, only 96 c (representing 35% of the global population) can report on safely managed water, and only a total of 84 countries (representing 48% of the global population) have reported on safely managed sanitation. Data availability can achieve a paradigm shift in conserving and adequately managing water, changing people behavior, spurring innovations and encourage deepened cooperation amongst riparian countries in transboundary basins. 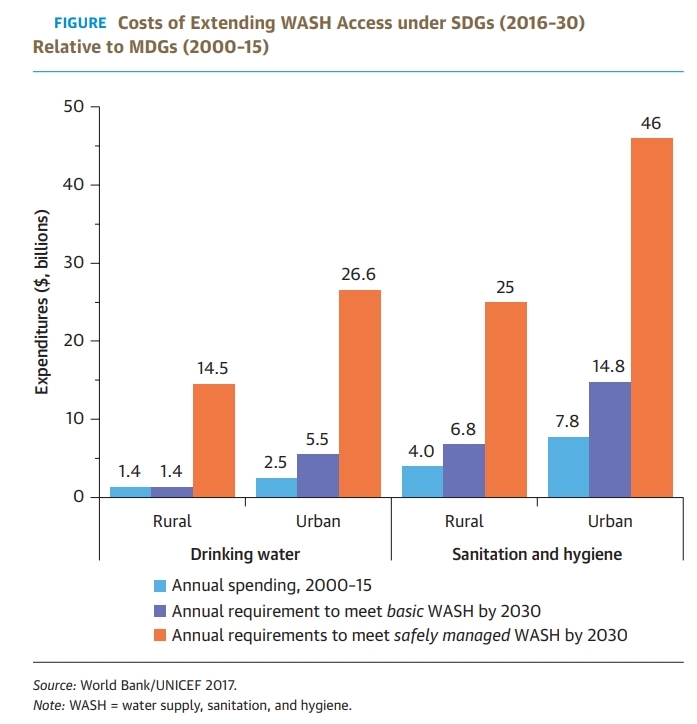 The below figure is a good example on how data can be a game-changer in sustainable development not only because of the major difference between urban and rural areas but also in the way we set our targets from basic water services in the Millennium Development Goals (MDGs) to safely managed water and sanitation in the SDGs to be met by 2030. It is clear that we are not on track to meet SDG6, according to UN-Water Synthesis report; especially if we continue with business as usual. Indeed, we may find that by 2030, millions more people will have been left behind. While millions of people worldwide have gained access to water services in recent years, many continue to suffer from Intermittent Water Supply. The High Level Panel on Water issued last year a report titled ‘Making Every Drop Count’ with various recommendations for increasing water sustainability. One of these was the World Water Data Initiative. This initiative aims to improve access to water data required for evidence-based decision making, primarily by reducing the cost and complexity for governments and communities. 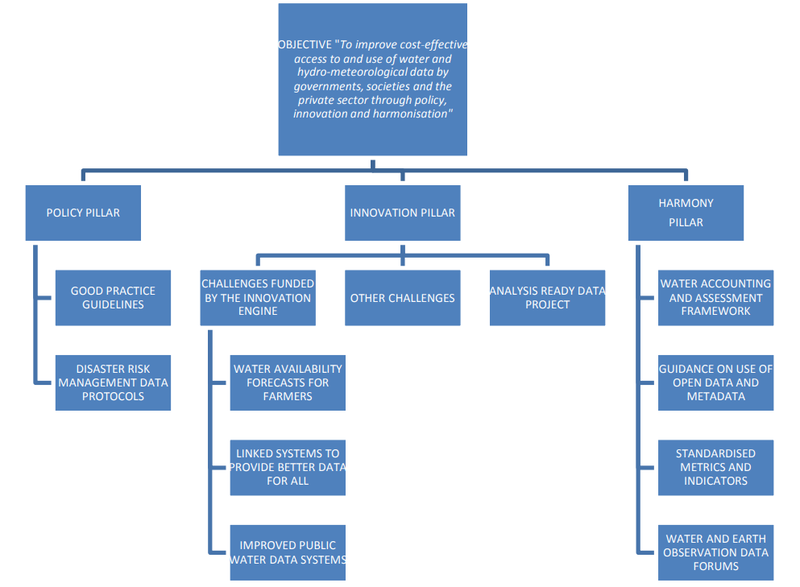 As shown in the below figure, the output of the initiative has three pillars of reform: policy, innovation and harmonisation to improve cost-effective access to water data.  Figure on high level outputs of the World Water Data Initiative. Albert Einstein wrote: “The world as we have created it is a process of our thinking. It cannot be changed without changing our thinking”. Data sharing is critical for the success of good governance in water management, the good water governance. It is important to address the barriers for data sharing in terms of legal restrictions or concerns around intellectual property, privacy, or potential liability. However, the public sector is pressured to make its data openly available. Open data can have significant benefits that could drive good governance, and make government and public utilities more transparent, accountable, and efficient. Moreover, open data can open the way to citizen empowerment. For instance, as per UNICEF, real-time monitoring has enabled the rural communities in Zimbabwe to obtain the WASH services they need. We must be able to make the utilisation of data and without adequate processing capacity or decision support systems, many individuals and institutions may not be able to make use of large volumes of data effectively. In consequence, there is a desperate need to consider access to and usability of data for decision making and moreover,including the capacities of the stakeholders to make use of large volumes of data. Data is the new water that will help ensure no one is left behind. Improved access to water data and better frameworks can help conserve water resources, change individual behaviour and spur innovations. But it requires robust infrastructure, good governance, sustainable funding, and long-term investment with engaged commitment from all stakeholders! Identifying the most innovative solutions to improve the availability and use of water data, it is important to form alliances namely with the private sector, technical agencies, politicians, and civil society to fill critical data gaps and ensure the continuity of attention needed to ensure no one is left behind. It is also critical to incorporate new data sources with long established ones, so that it is necessary to streamline the data governance and quality frameworks to ensure the transparent mechanisms. 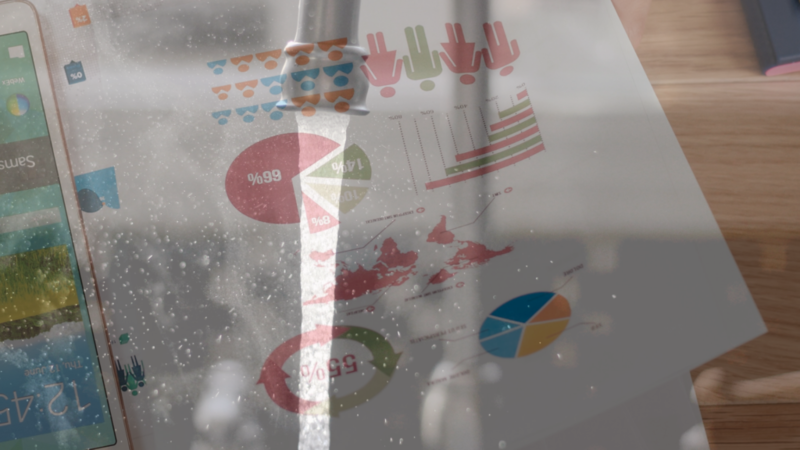 It is clear that there is a huge scope for innovation in big data technologies and the rise of digital water. This will not only bring optimisation to life for water utilities, reduce inequality , human biases and errors that are common with heuristic decision, it will reduce the transaction costs, the time involved in making these critical decisions to ensure availability and sustainable management of water and sanitation for all. 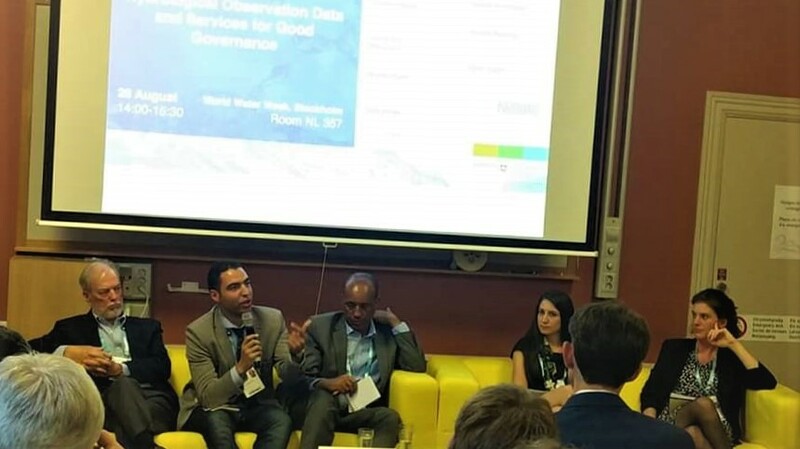 For more information, consult the outcomes of data for good governance session at Stockholm World Water Week 2018.